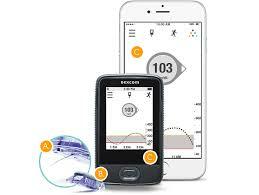 Diabetic Muscle & Fitness > Articles > Is the Dexcom G6 The Best CGM for Diabetes? 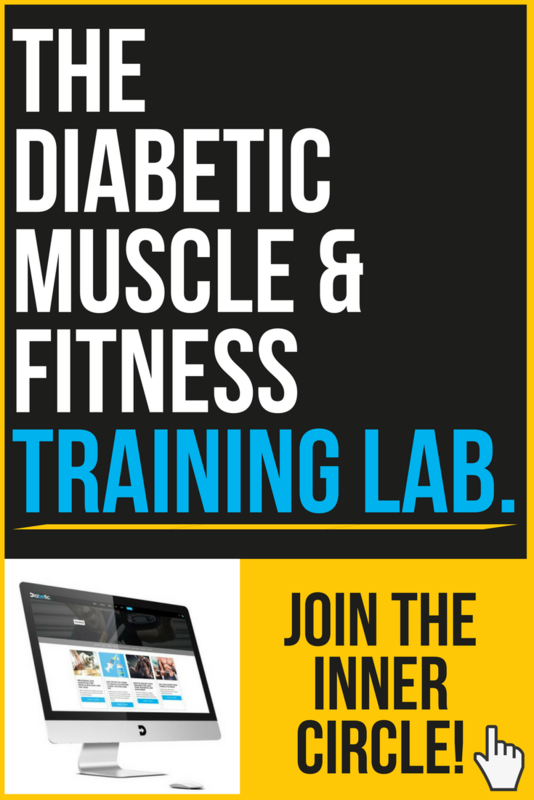 Welcome the Diabetic Muscle and Fitness product review comparing the Dexcom G6 vs. Dexcom G5 vs. Freestyle. The accuracy is less than 10% MARD for all people aged two years and older. Sensor life of 10 days. A 28% flatter transmitter profile. A new URGENT LOW SOON alert to prevent hypos. Alerts can be set by the time of day and day of the week. As you work your way through this comprehensive review, you will gain valuable insight into which product will suit you best. I co-authored the recent ACDC national CGM guidelines. 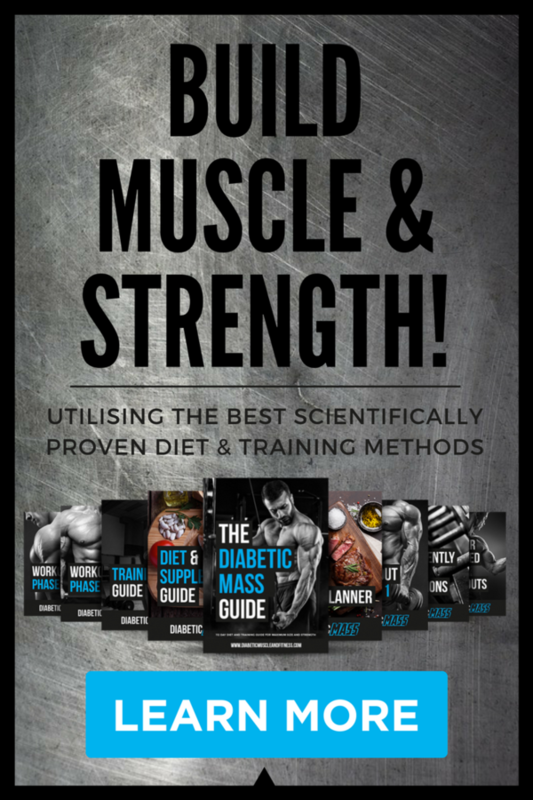 I wrote the detailed guide inside the Training Lab called “Become a CGM Pro.” Well worth checking out, if you haven’t already. I have extensively reviewed the Libre, Dexcom G5, Minimed 640G in previous VLOG’s. I have been wearing the Dexcom G5 for over two years. I educate people with diabetes on all CGM systems in my job as a Diabetes Specialist Dietitian. I train health care professionals on how to teach CGM systems. Which sensor is the easiest to insert? 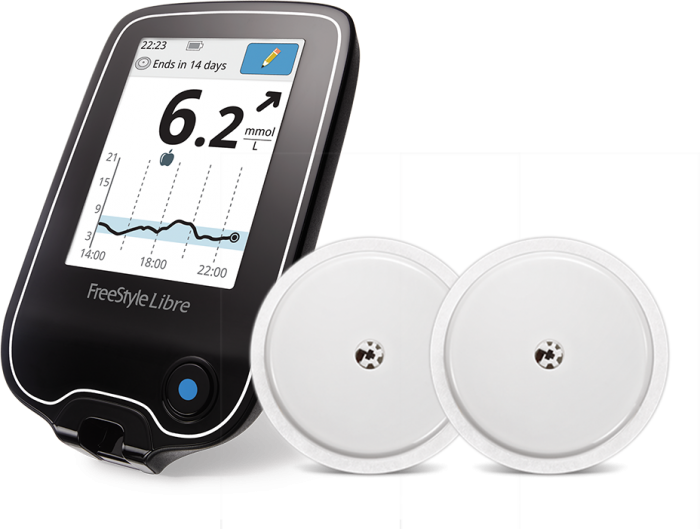 The Libre is the easiest to insert and has the lowest profile. It goes on the arm and has a much smaller adhesive area; this will become important as you read on. The Dexcom G6 new inserter is just as easy to insert as the Libre and it does not hurt, at all. Once the transmitter is on, it is much flatter than the G5, but not quite as low profile at the Libre. The Dexcom G5 manual sensor insertion requires you to push it in, this can hurt a bit. Also, the transmitter does stick out a lot more. This will become important as you will find out. Which sensor is the most accurate? The most popular method for measuring the accuracy of sensors is MARD: Mean Average Relative Difference. 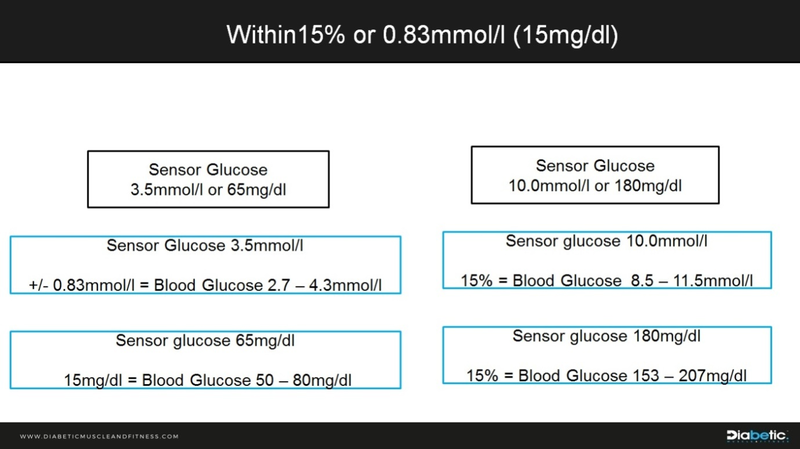 Simply, in percentage terms, how far is the blood glucose reading from the sensor glucose reading shown on the display. It is commonly said that if the MARD percentage for the sensor performance over its life (10 days G6, 14 days Libre, 7 days G5) is less than 10%, then the sensor readings can be used to replace finger stick. This table shows the marketed MARDS’s of the sensors, and the calibrations needed to get that accuracy. 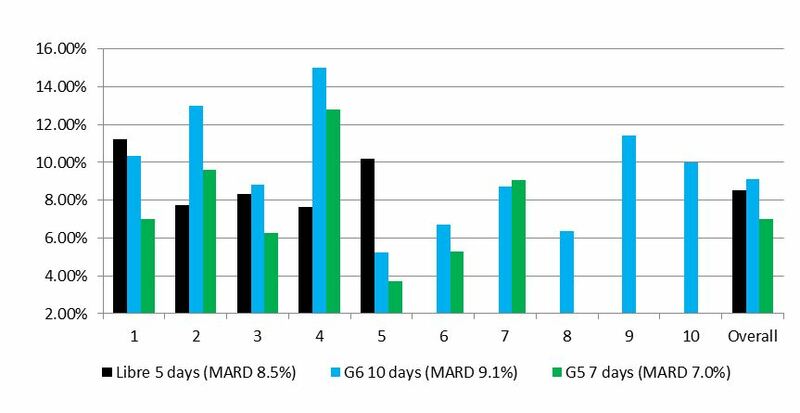 The graph below shows the MARD performance of the three sensors over the 10 days of my experiment. All three sensors performed at or better than the marketed MARD. The Libre MARD was 8.5% but only lasted 5 days – see later for details on why it came off after only 5 days. The Dexcom G6 MARD was 9.1% and lasted the full 10 days. This was achieved with ZERO calibrations! This impressed me. The Dexcom G5 MARD was 7.0% and lasted only 7 days. See why it came off shortly. Please note: MARD is a pretty useless value when it comes to knowing if you can trust the sensor glucose values to make a treatment decision. The most critical measure in my opinion, is how often you can safely use the sensor readings to make therapy decisions – treating hypos and giving corrections doses. The new standards applied to the Dexcom G6 look at this exact point. The standards look at how often the sensor glucose values can be used safely to make therapy decisions. The percentage of sensor glucose readings that are within 15% of the reference glucose measure for sensor reading in the normal and high range. For readings in the hypo range, how many sensor readings are within 0.83mmol/l (15mg/dl) of the reference glucose measure. The criteria in the table below are likely to become the standard for all future CGM and flash glucose systems. To gain some context, for blood glucose meters to be deemed safe to use, they have to meet ISO standards. 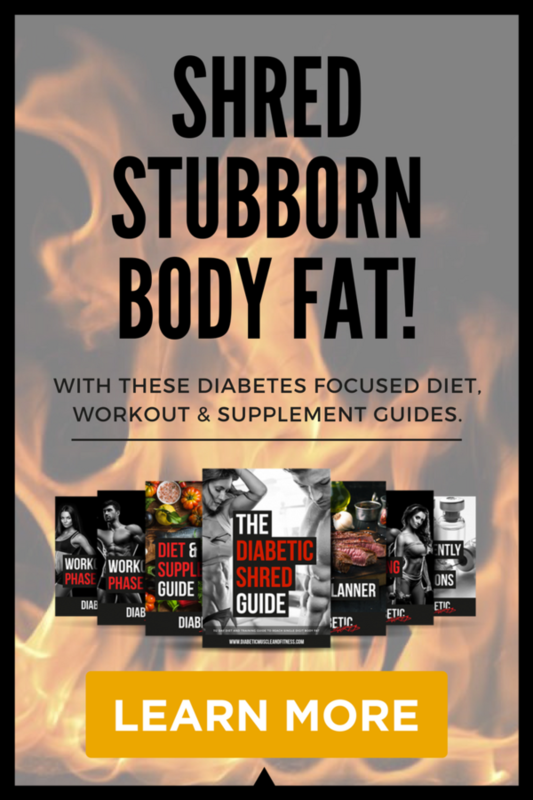 They have to have 95% of the blood glucose readings within 15% at all glucose ranges (1)! The blood glucose meters have MARD’s at 4-5%. Once the accuracy goes outside of 15%, you start to treat hypos that are not hypos or miss them. Also, you begin to over or under correct high glucose levels. In short, you get very erratic control because the sensor is not accurate enough! 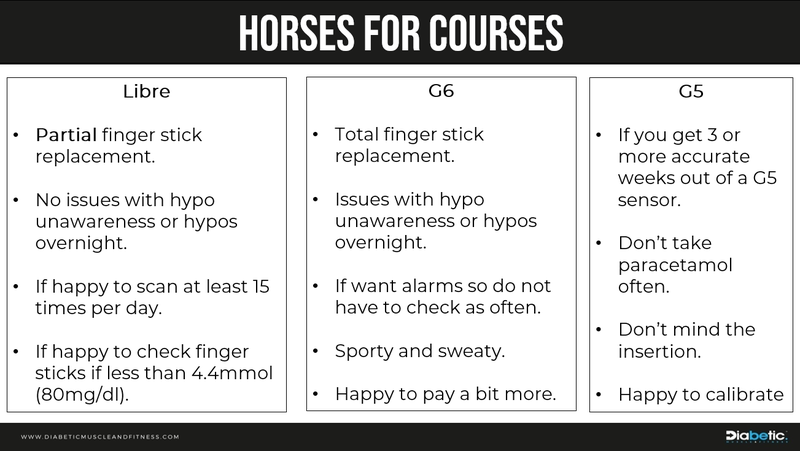 This graphic from one of the modules inside Training Lab gives examples of the range allowed in the hypo and high range. Now this seems like a practical measure that relates to real life. 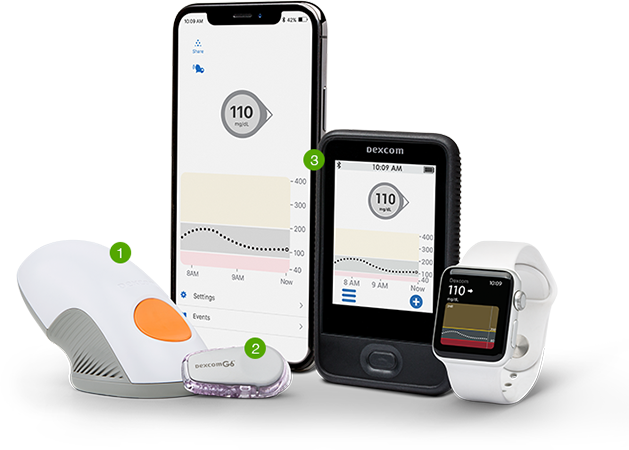 So, I have accessed the data submitted to FDA to see how the three sensors measure up – Libre (2), Dexcom G5 (3), Dexcom G6 (4). Adult data submitted to FDA of CGM within 15% or 0.83mmol/l (15mg/dl) of reference glucose. 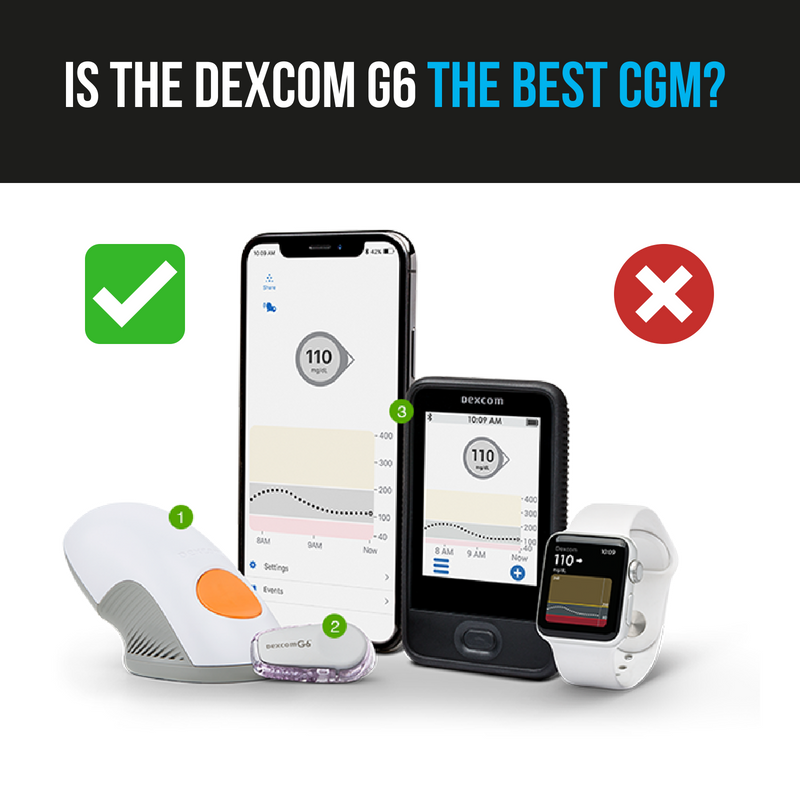 The Dexcom G6 and G5 are very accurate and get it right 90% of the time. Only 1 time out of 10 you might miss a hypo or have hypo treatment when not necessary. This is why the FDA and CE mark have approved for TOTAL finger Stick replacement, and the G6 does this with ZERO calibrations. Both systems would meet the future criteria of 85%. The Libre gets it right 65% of the time. So, 3-4 times out of 10 you will miss or treat for a hypo incorrectly. This is why the FDA and CE mark say you must test blood glucose if the Libre says you are hypo. This is why the Libre is PARTIAL finger stick replacement. The Libre would not meet the future criteria of 85%. All three sensors meet the standard of >70% of the time. All three sensors meet the standard of >80% of the time. Paediatric data submitted to FDA of CGM within 15% or 0.83mmol/l (15mg/dl) of reference glucose. My data submitted to FDA of CGM within 15% or 0.83mmol/l (15mg/dl) of reference glucose. The Dexcom G6 and G5 were very accurate, with the G6 hitting 95% accuracy. I am happy to use both the G5 and G6 for total finger stick replacement, especially in the low glucose range. Even though the Libre had an overall MARD of 8.5% for the 5 days, the accuracy in the hypo range 70%. With 3 out of 10 readings leading to an incorrect decision. I am not happy to trust the Libre in the lower ranges and would always confirm with a finger stick. All three got it right 85% or more of the time. I am happy with this accuracy, even though 1 in 10 times I will get an incorrect correction dose. I feel this is a fair trade-off. I did not have any readings above 10.0mmol/l in the 10 days. I usually have some. It must be the fact I was completely ON IT – as I knew I was being watched. Do the sensors stay in place for the marketed time? See this video for how and when the Libre on day 5 and Dexcom G5 on day 8 came out. The Libre has a small adhesive area which caused a problem for me. With my heavy sweating from exercise and saunas, it came out quickly. I had had this problem before and tried many things including rock tape, Skintac, and bands. But for me, none of them seemed to keep in place for the advertised 14 days. This may not be a problem if you do not sweat a lot during exercise or like the sauna. The G5 got kicked out by my daughter Grace on day 8. The G6 did not encounter the same problem, which may be due to its flatter profile – 28% is the marketing claim. I also noticed the G6 did not get caught on my belt line at the same frequency as the G5. How does the Urgent Low Soon alert work? 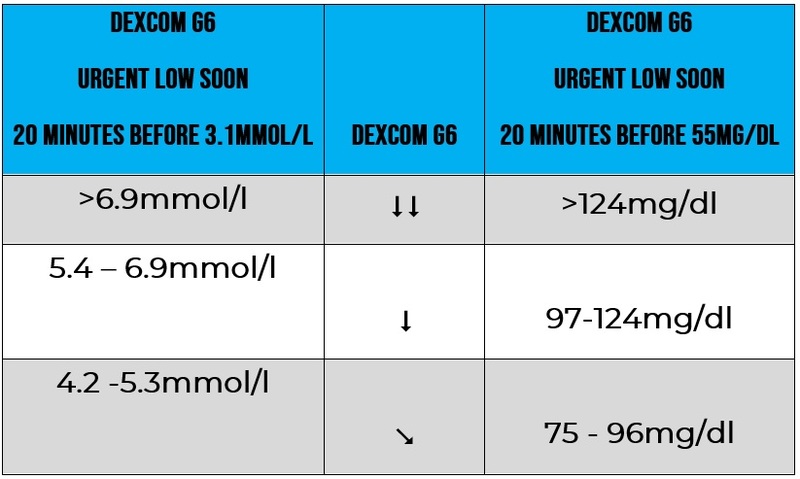 The Dexcom G6 has a new alert that alerts you 20 minutes before hitting 3.1mmol/l (55mg/dl). The Urgent Low Soon was very useful for me as I treat hypos below 3.5mmol/l (65mg/dl). Therefore, I could get glucose down my neck before I went hypo. I did not get alarm fatigue because it went off just at the right time. Previous systems have used with predictive alarms can become a nuisance. This did not happen with the Urgent Low Soon Alarm. For young children and people with hypo unawareness, I do think they might miss a few hypos if they treat at 3.9mmol/l (70mg/dl). It would be helpful if the setting of 3.1mmol/l could be altered to be higher. Maybe 20 minutes before 3.5mmol/l for children and 4.0mmol/l for people with hypo unawareness might do the trick. Maybe Dexcom could make this available in a future software upgrade? Does Paracetamol cause problems with the Dexcom G6? The G6 markets that the new technology prevents paracetamol from impacting the glucose readings. See this video for the paracetamol test I did. Paracetamol only seemed to increase the G5 level at one hour slightly, and by three hours there were no issues. This may have had minimal impact on me because I weight 100kg and only took 1000mg. If I was a young child taking Calpol, this might be different? What are the differences in the displays? The G6 and G5 allow you to change the timeframe on display from 1hr, 3hr, 6hr, 12kh, and 24hr. The Libre keeps the display constant at 8hrs. 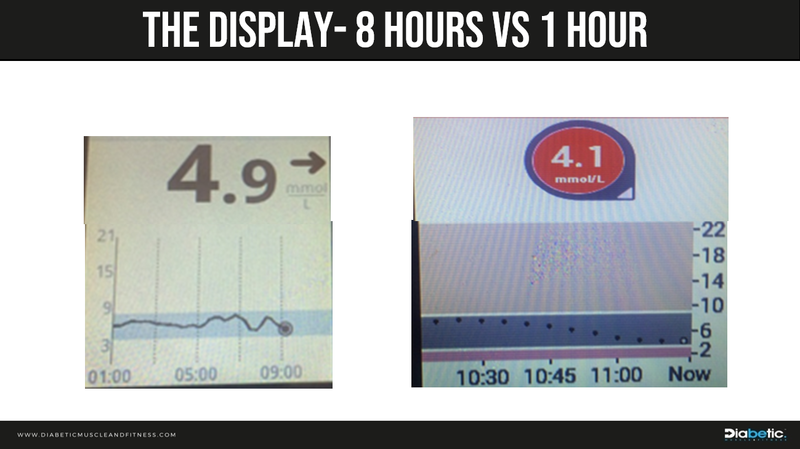 This graphic shows the 8 hours Libre display vs. the Dexcom 1-hour display. The arrows are determined by 15-minutes’ worth of glucose readings which is adequate most of the time. But during exercise or fast moving glucose, the 5-minute changes are more informative. The G6 and G5 allow the display to be changed to 1 hour that shows each dot as the last 5 minutes. This will enable you to see the change before the arrow changes. In the above the example you can see the G6 has already flattened in the last 5 minutes. Therefore, I would not have fast acting glucose. The arrow will catch up in 10-minutes time. 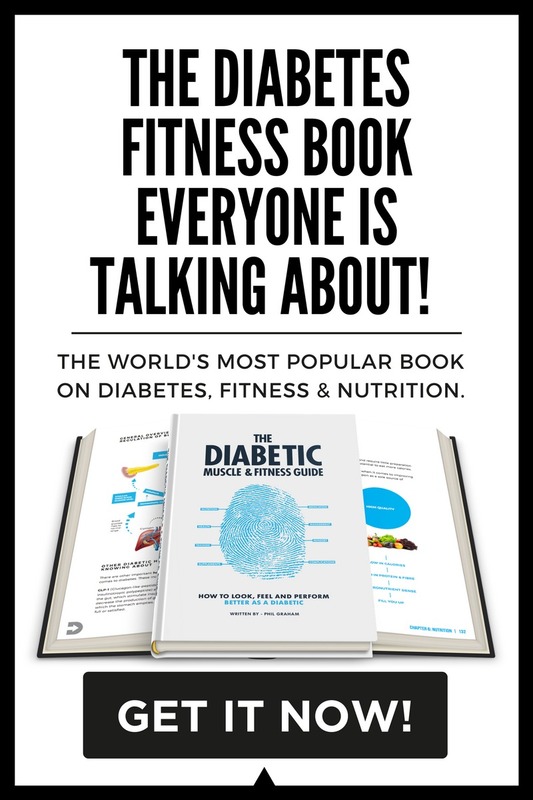 This is an advantage if you want to micromanage your diabetes, and very useful during exercise when glucose changes quickly. How do the sensors perform in the Sauna? 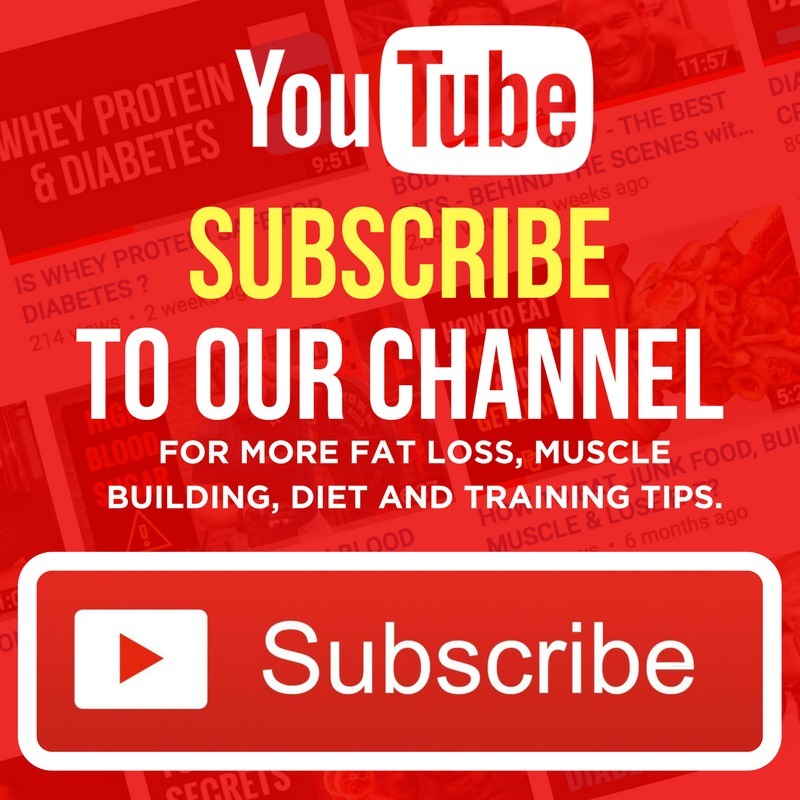 Check out this video for the sensor’s performance during an infrared sauna. Getting this sweaty regularly does cause problems with adhesive, especially the Libre. How do the sensors perform during different types of Exercise? See this video for the sensor’s performance during aerobic and HITT training. and strength training exercise. See this video for the sensor’s performance during strength training exercise. All sensors were accurate during aerobic exercise. The G5 and G6 were accurate during HITT exercise. The Libre had fallen out by then. The G6 was accurate during strength training. Both the G5 and Libre had come out by then. How do the systems compare in cost? See this video for the cost for a discussion of the UK cost. If you are outside the UK, please contact the companies. The Libre is cheaper but it’s only partial finger stick replacement, and you do not get alarms and alerts. See this video and graphic for my final thoughts on who might suit the different systems. I hope you have found this product review useful. Does calibrating make it more accurate? Please share this with friends or healthcare professionals you think will benefit from the information, especially around how to think beyond MARD! Please leave comments on your experience with any of the products.